Discover how to experience congregational work as an integrated element in a fully rounded spiritual life. Written for both those in the more typically recognized "leadership roles"-such as board members and committee chairs-as well as for those who lead while serving on a committee, teaching in religious education or helping to pull together the Holiday Fair. Makes a useful addition to a congregation's leadership development programs. 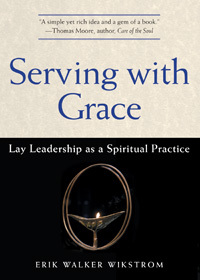 Lay Leadership as a Spiritual Practice Webinar from UUA Bookstore on Vimeo. Additional resources for this title are available at no charge on the Skinner House Companion Resources page. "If spirituality is anything, it is everything. Those who think about their spiritual lives as somehow separate and distinct from the rest of their lives don't yet understand that spirituality is about wholeness. (The word "whole" shares linguistic and philosophical roots with the word "holy.") There is no separate spiritual sphere. To the woman or man who is living in the spirit, there is nothing but spirit." "What a good book - useful, provocative, interesting! Erik Walker Wikstrom challenges the reader to think about not only what, but why and especially how she or he approaches congregational leadership. It belongs on the shelves of every church library and in the hands of every one of its leaders." "Erik Wikstrom seeks to "radically reconceptualize" church leadership, urging us to make the practice of leadership a spiritual practice, too. Both wise and pragmatic, Serving With Grace points the way toward spiritual growth and learning not only in the sanctuary, but in the meeting room." "Meditation, ritual and prayer are the glamorous side of the spiritual life, but service is its heart. Serving With Grace combines the idea that service is spirituality with practical ways of living it out. It shows leaders how to be mindful in ways that bring out the spiritual in ordinary forms of service. It's a simple yet rich idea and a gem of a book."